I am on the major hunt for cute clothes for my baby girl because I just realized I have nothing cute and girly for her! I found one of the cutest clothing items from Beba Bean and I can't wait to put it on her after she is born! At Beba Bean, they thoughtfully design the very best in baby products ensuring every gift you give is thoughtful, adorable and memorable - including the bestselling Pee Pee Teepee™, baby clothing, infant blankets and swaddlers, baby toys and baby shoes. Their focus is creating the most loved baby gifts and the soul of their business is the celebration of childhood. Every piece they design has a personal touch. They always take into account the things they love about children and how to make life easier for every parent. You will only find the highest quality products. Much care is taken to ensure that they only use fair trade factories, and every item tested and approved. I generously received the Knit Cape in Ivory. For your little riding hood, they have launched this new line of adorable hooded capes with striped inner hood detailing. This cape is easy to get on and off and is adorned with a vintage wood toggle button detail. One size fits 6-24 months. Measures 21" X 10", 100% cotton, machine wash, tumble dry low. Isn't this cape not the cutest??!! This Knit Cape is made very well and will hold up against wear and washing over and over! I love how soft and comfortable the cotton is and the neutral color will match with so many cute outfits and dresses to keep my little daughter warm, but fashionable at the same time! If you are looking for innovative, fun and cute baby products and gifts, make sure you head over to Beba Bean and check out their amazing selection of baby products and clothing! 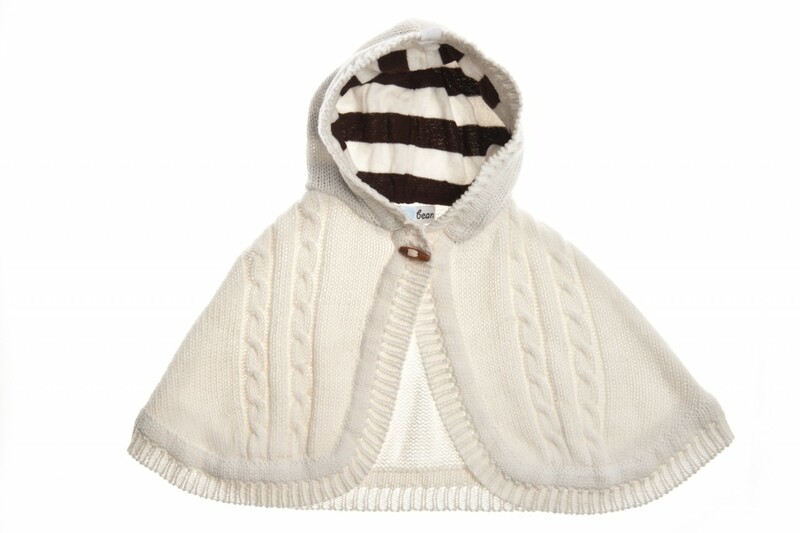 Buy It: You can purchase the Knit Cape in Ivory for $31.00 on the Beba Bean website. What a cute blog! I love it!